This post is sponsored by Welch’s but the content and opinions expressed here are my own. 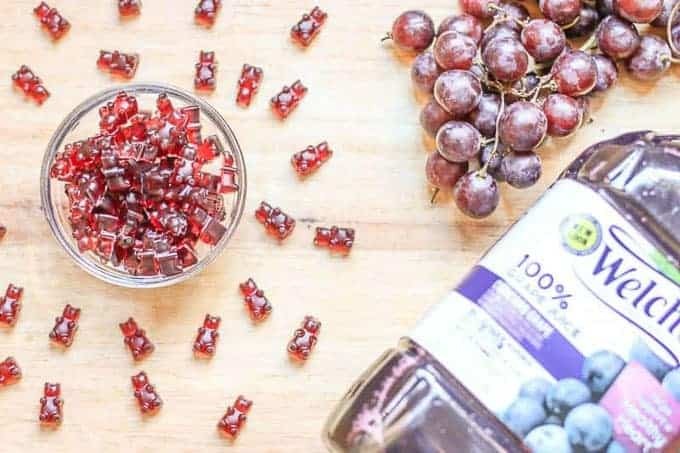 This is an easy, healthy, gluten free Homemade Gummy Bear Fruit Snacks recipe! It is made with only 3 ingredients: Welch’s 100% Grape Juice, honey, and Gelatine! Need a healthy snack your whole family will love? These yummy gummy bear fruit snacks will put a big smile on your family’s face. 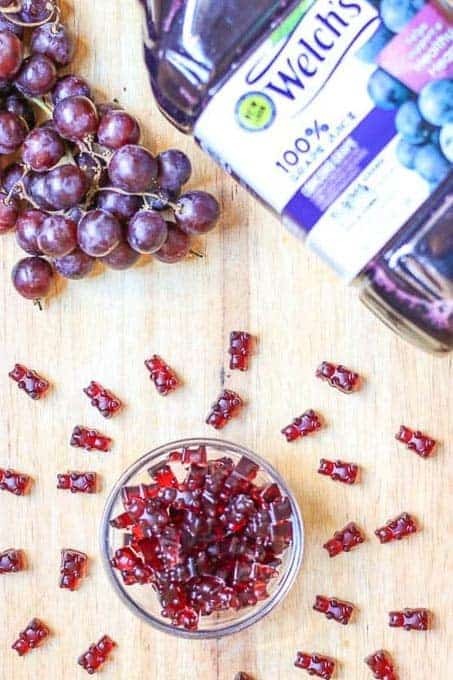 This easy heart-healthy treat made with Welch’s 100% Grape juice with no artificial coloring or flavoring. It is fun to make and delicious to eat! Why use Welch’s 100% Grape Juice? Besides it tasting amazing, Welch’s use Concord Grapes. The dark, thick purple skin and crunch seeds of the Concord grapes contain powerful plant nutrients called polyphenols. Polyphenols play a role in a healthy heart by promoting healthy circulation and blood pumping. Welch’s Juice is Non-GMO, gluten free, has no artificial flavors, and no added sugar. It is loaded with Vitamin C. So love your juice, love your life! 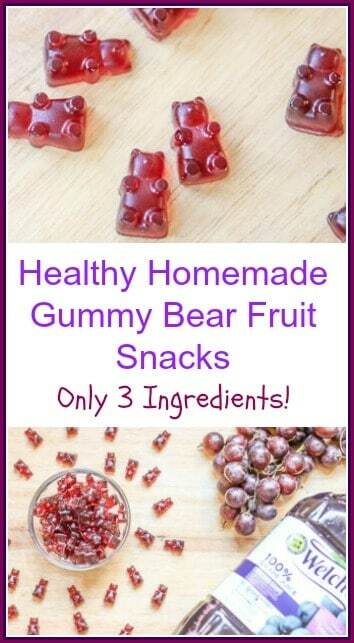 These little gummy bears make a great healthy snack for kids! You just combine Welch’s 100% Grape Juice, honey, and Gelatine in a sauce pan. Heat mixture until it is completely dissolved and forms a runny texture.
. You can use other shaped candy molds also, but I suggest using Silicone. It makes removing the gummies easy. Then you refrigerate for about 2 hours and they are ready to eat! How easy is that? This is such a great, delicious, heart-healthy snack perfect for eating at home or on the go. You are going to this sweet little fruit snack treat! Like this recipe? Check out: Homemade Dog Treats, and DIY Valentine’s Day Gift for Classmates. *Note: This recipe is made to be healthy. While it taste good, it is not loaded with extra sugar, so it is not as sweet as the store bought fruit snacks. If you want the gummy bears to taste sweeter, add more honey. 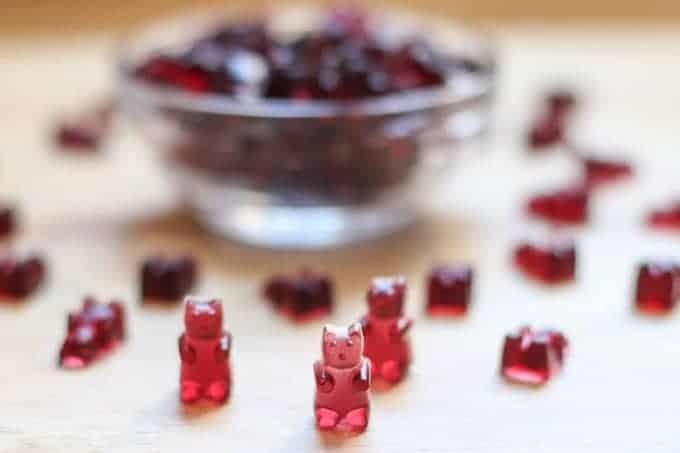 This is an easy, healthy, gluten free Homemade Gummy Bear Fruit Snacks recipe! It is made with only 3 ingredients: Welch's 100% Grape Juice, honey, and Gelatine! Mix all ingredients in sauce pan. Cook on medium heat until ingredients are completely dissolved and mixture is runny. Using a dropper, drop gelatin mixture in candy mold. My grocery store sells Knox Gelatine. That is what I use. Hope that helps. Hello! Can you tell me what brand of gelatin you use? I made these a few days ago, came out great. Does not taste as sweet as the juice though, fyi. Although not as sweet as the juice my 4 year old loved them. Made me think I could up the healthy factor and used a kale/ spinach/ apple juice mixed green juice from trader Joe’s. Was a little worried I was pushing my luck but my daughter loved those as well (I did add honey to both of course and maybe slightly more to the green juice recipe). Also, there is apple juice in the green juice – not a favorite of mine for trying to be healthy, but still nice knowing my 4 year old I’d enjoying the gummies that are not preservative, extra sugar laden, with some veg content, etc. My gummies did not set up and they stuck to my mold.Does any one have a good answer why this happen? I have made these with tart cherry juice and beef gelatin, they last at least 2-3 weeks in a sealed container in the fridge with no change to quality! I think they’d last much longer but I ate them all before I could find out! I tried making these and my gummies never hardened. Any idea what I did wrong? Thank you!!! I would refrigerate them because they will dry out… As far as shell life, I am guessing a week. I honestly am not sure. They don’t last past a couple days at our house, but they don’t have preservatives, so they eventually could go bad. Do they need to be continually refrigerated? What is the approximate shelf life? Honey adds a bit of sweetness. The Gummy Bears are not very sweet even with the honey… Especially if you compare them to the store bought gummies. Does the honey do anything to make it gel better–just thinking that grape juice is already so sweet? I am sure another juice would be great, but I have not personally tried it or created it to confirm it. Could I use a different flavor juice? I know it’s a bit late but I ended up putting 1/2 tablespoon of lemon juice in mine and it turned out great. Just keep in mind that the texture of it is not 100% like the gummy bears you buy at the store. These are like eating lightly firmer jell-o. I honestly don’t know the answer to that… Sorry. Do you think you could add a little lemon to help preserve them for longer or would that interfere with the gelling? Cannot wait to try some of these! There aren’t any preservatives…. So I am unsure how long they will keep, but if you store them in the refrigerator, they should last a couple of days. You can use other juices. These are awesome. I’m defs going to try it. How long are the gummies good for? No, you do not need to grease the mold. Bre, I am not sure how to give you an exact answer, but there is much less sugar and preservatives in this recipe than buying the store bought almost candy gummies. They will also taste less sweet…. From what I understand, gelatin is actually good for you. I am not a nutritionist, so this is based on what I have read. Here a couple links about the health benefits of gelatin: http://www.ba-bamail.com/content.aspx?emailid=16012 and http://thecrunchymoose.com/gelatin/ Hope this helps. Already keeping in mind that moderation is best, do you know if there is a limit to how many of these can be eaten? Is a serving size 5-6 lil bears like would be in a snack bag? Is too much gelatin not good for you? Thank you!!! Where can I get the mini molds? I would keep them refrigerated or in a lunch box with an ice pack. There are no added preservatives, so I am not sure if they would not go bad. Yum, my kids would love these!! Love that they are sweetened with honey. Now I just need to get my hands on some gelatin. OMG, my kids would flip if I made these for them. How cute are THESE?! My kids will happily snarf these gummies down. I love that they’re a healthy snack too—SCORE! These are so much fun, and it doesn’t get much better than grape juice. I have some large gummy bear molds, but I need to pick up some of these tiny ones – they’re perfect! Thank you so much for this natural. 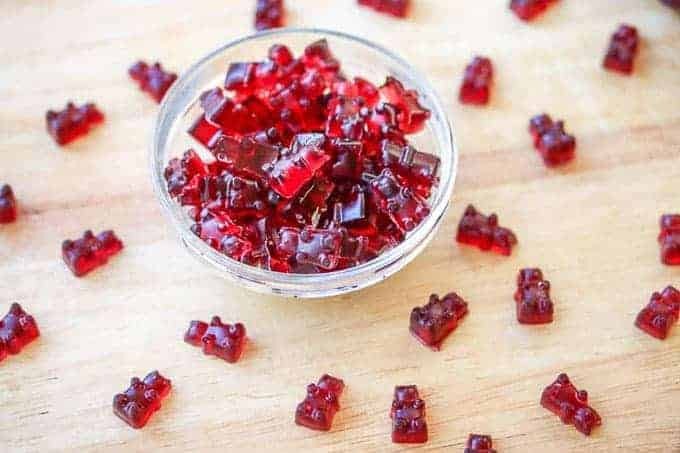 healthy gummy bear recipe. I just read where the store variety may contain some very unhealthy ingredients. I love gummy candies! But I especially love the idea of a healthy version! These are adorable. I love how few ingredients there are, and I’m wondering if I could make them with agar agar to make them vegetarian.